Spacious rooms at a fair price in a clean and updated hotel. Clean, comfortable, moderately priced, perfect for us! The coffee was a little weak. Loved it. Would very much consider staying there again. Very clean, well maintained, and a very nice "ORA" about it. Only complaint (minor). elevator was quite slow. 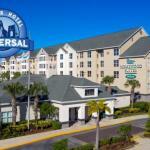 The 122 all-suites Homewood Suites by Hilton Orlando-Nearest to Universal Studios is located just off Interstate 4 and provides top quality accommodation for both families on vacation and the business traveler. Items included with the room rate are a hot breakfast buffet, a light dinner and cocktails on midweek evenings, high-speed Internet access, local telephone calls, a morning newspaper and parking. There are is one room available for business or social functions that can accommodate 40 guests. Area landmarks and attractions include Walt Disney World, SeaWorld, the Islands of Adventure amusement park, the Orlando Convention Center, the Florida Citrus Bowl, Amway Arena, home of the Orlando Magic basketball team and shopping at the Prime Outlet Shopping Mall, Fashion Square Mall and the Florida Mall. The one-bedroom suites have separate living and sleeping areas. Each has a fully-equipped kitchen with full-size refrigerator, microwave oven, two-burner stove, dishwasher and tea and coffee making facilities. Other amenities include two remote control televisions with news and cable channels, high speed Internet access, two telephones with voicemail, an iron and ironing board and a hairdryer. This hotel has an outdoor swimming pool, tennis and basketball courts and a fitness center. Restaurants nearby include a TGI Fridays, PF Changs China Bistro, Red Lobster, Olive Garden and an Elephant Bar Restaurant. The 24-hour front desk has safe deposit boxes and information on the Orlando attractions and events. Other amenities include a coin-operated laundry, an ATM, video arcade, business center, a convenience store and gift shop and ice and vending machines. Many visitors to Orlando say this is a great hotel, with great prices in a great location. Many liked the ability to walk to Universal Studios and the Wet n Wild Water Park. The cheerful crew of employees had lots of helpful ideas about where to shop and dine and the best time to visit the theme parks. Most clients said the complimentary breakfast was very good and made a suitable start to a hectic day of theme parks, shopping or sightseeing.